In Signs > Automobile Signs > Show & Tell. Today was a great day to be a picker! 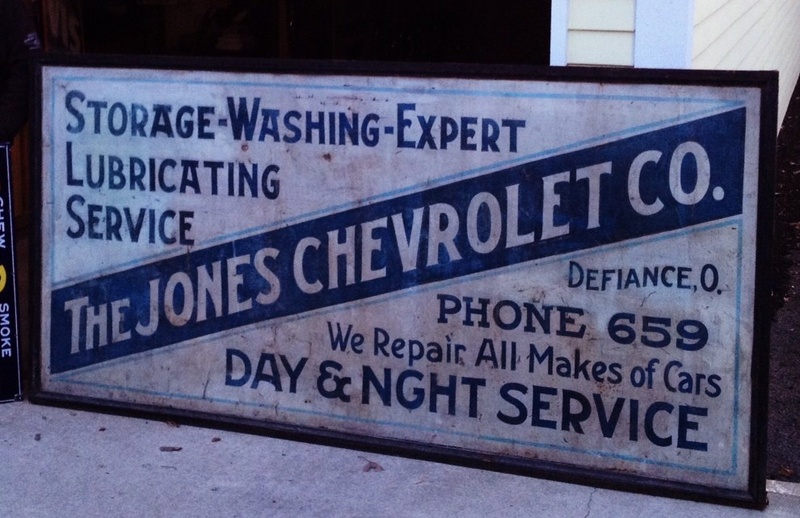 I was over in Defiance, Ohio and picked this 1926 Chevrolet Dealership sign that hung on the outside of the building in the 1920's before The Great Depression. This sign has been in Defiance, Ohio all these years and today it came home with me. There is only one more that exist and I was told the lady wasn't ready to part with it. The sign is special because my last name is Jones and I worked at GM for thirty-five years and am a Chevrolet lover. The sign has the original frame and on the back is stamped St. Louis, Missouri. The sign is large and takes up a lot of real estate on the wall but you will probably never see another one. The sign is 4' x 8'. Just look at the three digit phone number, the abbreviation for Ohio and the way they abbreviate night. The sign has a lot of positive things going for it to also help date it. The Defiance Public Library has this in it's records, which also proves the date of the sign. The Chevrolet Dealership was at 616 Clinton Street Defiance, Ohio. Hope you all enjoy. Great find, just my size too. The bigger the better I always say. Thank you Trey for the love and the nice comment! Thank you aghcollect for the love! 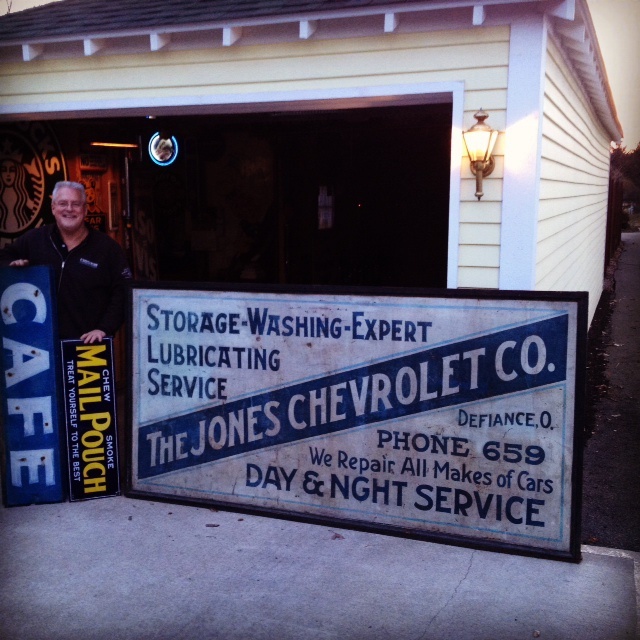 That sign has found the perfect home, it doesn't get any better than finding the perfect piece to top off a stellar collection such as yours Michael! Now THIS is WAAAAY over the top, "officialfuel Jones!" Wow! What a find! Good for you. No matter how much room it takes to display, it's a perfect find for you...congrats! Thank you racer4four for the love! Thank you pops52 for the love! Have a great weekend! Thank you jamiedpt for the love! Have a great weekend! Well worth rearranging your walls! Thank you geo26e for the love! Have a great weekend! Thank you chevy59 for the love! Have a great weekend! Thank you packrat-place for the love! Have a great weekend! Thank you DrFluffy for the love! Have a great weekend! Thank you mtg75 for the love! Have a great day! What a fantastic sign you found!! Thank you RAD21289 for the love! Have a great day! Great sign close to my hometown! Thank you valentino97 for the love! Thank you Manikin for the love! Thank you MooreAntique for the love! Thank you EJW-54 for the love! Thank you Rivertrout for the love! Thank you Chevelleman69 for the love! Thank you billyg for the love! Thank you pickrknows for the love and the awesome compliment!! Thank you vetraio50 for the love! Thank you Eyewideopen for the love! Thank you jjsr for the love! Thank you trukn20 for the love! Thank you rustyboltz for the love! Thank you Nova for the love and the great comment! Thank you pw-collector for the love! Thank you SPEEDWAYPICKER for the love! Thank you gargoylecollector for the love and your comment! Can't believe you don't love the Conoco script gas pump I posted on here. I know you love gas and oil. Have a great day and good luck picking! Been out for quiet a while,probably missed a lot! Thank you leighannrn for the love! Thank you Cathy1234 for the love! Thank you egreeley1976 for the love! Thank you farmlady for the love! Thank you sugargirl for the love! Thank you ttomtucker for the love! Have a great day! Thank you Beachbum58 for the love! Thank you Designer for the love! Thank you sanhardin for the love! Thank you Radegunder for the love and the compliment! Thank you AntigueToys for the love! Thank you inky for the love! Thank you jameyrd for the love! Thank you rniederman for the love and the nice compliment! Thank you kerry for the love! Thank you upstatenycollector for the love! Thank you kingshawn for the love! Thank you antiquerose for the love! Thank you mikelv85 for the love! Thank you straightleg for the love! Thank you Roycroftbooksfromme1 for the love! Thank you MountainGirl, petey and snowman3 for the loves! Thank you Lady_Picker for the love! Thank you rikanddonna for the love! Thank you Jewels, rikanddonna and vintagegirl66 for the loves! Thank you RAD21289 for the love!